Me? 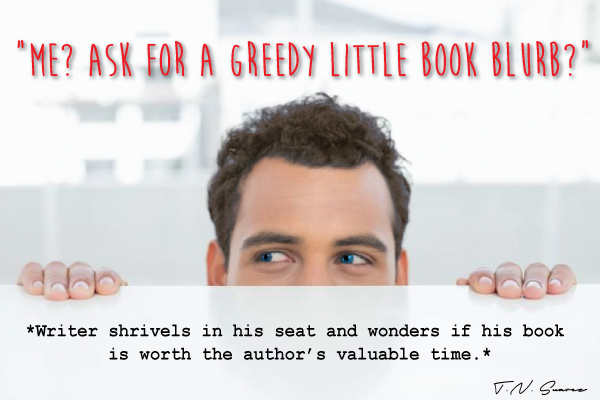 Ask for a greedy little book blurb? A wave of terror crashes over you as you sit alone in your comfy writer attire (i.e. robe, sweats, tutu, or whatever flips your chicken) researching fellow notables in your field and then tossing back your third cup of joe. Most writers are private individuals, creating alternate worlds for others to enjoy without the pressure of being in the spotlight. However, once a book is ready for publication, the game changes. The outer rim of the radiant publisher’s spotlight stretches across your keyboard, casting its warmth on the task at hand: IT’S ENDORSEMENT TIME! You shrivel in your seat and reluctantly set up a list of potentials, wondering if your book is worth their valuable time. Start local. Try friends first. Yes, anyone can blurb if they enjoy your writing. If you don’t have writerish friends, contact writers whose books are of a similar flavor. Don’t ask a romance writer to blurb if you’re publishing science fiction. Pursue authors with works that you’ve, in fact, read and adored. Their fans would potentially like your work as well. Now that you’ve established your fave writers, it’s time to get in touch with them. Most writers have a personal website with a contact form or an email address available to contact the author directly. If that information is unavailable, Twitter or Facebook might be another point of contact. If all else fails, check www.publishersmarketplace.com for the author’s agent information and contact their agent to see if they will put you in touch with the writer. MUY IMPORTANTE: When you reach out to a notable for a blurb, don’t beg, butter, or stalk. Ask them—once. Every writer has been in this uncomfortable spot and has had to ask other authors the flattering but time-consuming question. We all understand what the process entails. Though some genuine flattery will get you far, don’t overserve your request with their personal scoop you’ve freshly spooned from the internet. Remember, you’re contacting a stranger. With that kind of information, you’ll certainly be serving it with stalker cherry on top. Simply let him or her know that you’ve read their work, and you hold it in high regard, and keep it professional. Blurb request multiple writers. It’s the same mindset of querying agents. You’ve researched them, formulated your favorites, and sent out numerous letters, all for different reasons. The same should apply to your blurb requests. You will get rejections along the way. Don’t take them personally. It’s all subjective, remember? Nothing is worse than asking why they’ve rejected you. JUST DON’T. There are multitudes of reasons for their decline, but asking “why” isn’t going to change their mind. Be polite. Thank them for their time and move on. Lastly, do keep sending requests until you receive a handful of endorsements for your book. Before long, your book will be published, and you’ll be fortunate enough to be reading and blurbing for others. Please let the vulnerability of the blurbing process linger as you pay it forward, and never forget the authors who gave up their precious time to give your work a chance.